Photo 1: Meroe pyramids at sunrise, Sudan (Source: Valerian Guillot, Flickr). Authors: Asim El-Moghraby is an Emeritus Professor of Ecology atvthe University of Khartoum, Sudan. He is a member of the Sudanese National Academy of Science and a founding member of the Sudanese Environment Conservation Society. Peer Reviewer: Eltigani E. Abdelgalil is an Associate Professor on water resources management. He works at the Water Management and Irrigation Institute (WMII) of the University of Gezira as researcher and now he is the Dean of the Institute. He also works as agricultural water resources expert. With an area of 1.8 million km², Sudan is the third-largest country in Africa. It consists generally of flat plains, with a few mountain outcrops such as Jebel Marra in the west, the Red Sea Hills in the east and the Ingessna Hills and the Nuba Mountains in the centre. It is bordered by seven countries and has a coastline of 750km (Map 1). The climate is tropical, with large daily and seasonal variations in temperature. Climatic zones range from arid desert in the north to semi-arid in the extreme south, which is affected by the monsoon. The average annual rainfall increases from north to south, ranging from almost zero millimetres (mm) in the north to over 800mm in the tall grass savannah regions in the south, and from a few days to four months in duration (Figure 2). Average annual rainfall has declined from about 425mm to about 360mm. The maximum temperature in summer ranges between 37oC and 44oC. The maximum temperature in the coldest month ranges between 18oC and 21oC. The climatic pattern is interrupted by the winter rainfall regime along the Red Sea coast and in its highlands. As of 2017, the population of Sudan is around 42 million. Figure 1 illustrates the population trend between 1956 and 2011. Sudan has a high number of young people, with 62% of the population aged 25 years and under. The annual population growth rate has been estimated in the four conducted censuses as 2.2%. Around 33.2% of the population lives in urban centres. Not only is the geographical distribution of the population highly unbalanced, population density has increased from 13 people/km2 in 1994 to a national average of 16 people/km2 in 2008, with higher concentrations in the main towns. 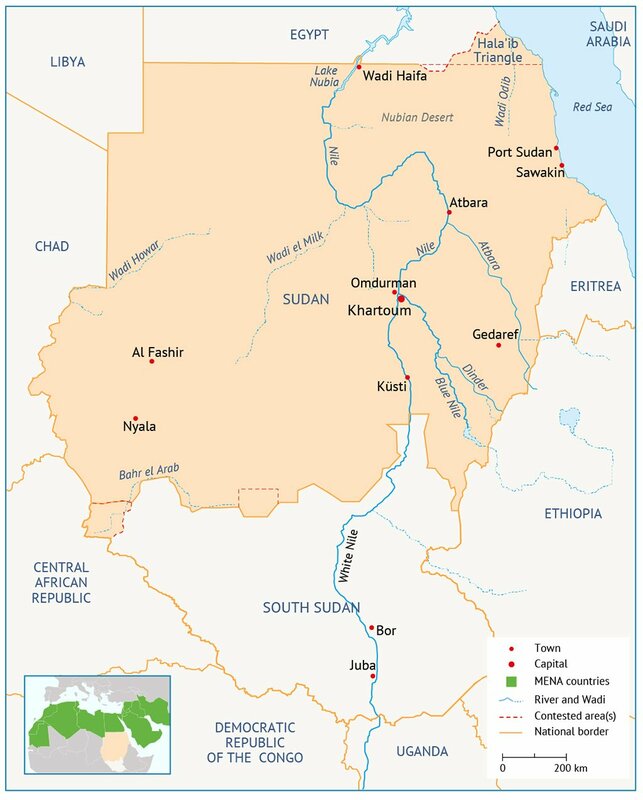 The population density is 238 people/km2 in Khartoum and 153 people/km2 in Gezira State and along the more fertile floodplains of the Nile. All these factors are creating a critical socio-economic burden for these states. The percentage of the population with access to safe drinking water was estimated to be 51% in 2008, compared with 75% of the urban population that had access to sanitation services. Sudan’s gross domestic product (GDP) per capita was $1,923 in 2016, which is equivalent to 15% of the global average. The Sudanese economy is heavily oriented towards agriculture and nomadism. The average contribution of the various economic sectors to GDP, excluding petroleum, is as follows: agriculture including forestry, animal wealth and fishing is about 39%; commerce, finance and services 36%; industry and mining about 11%; transport and communication 6%; and construction about 6%. Biomass (fuel wood, charcoal and crop residues) is the major source of energy, especially in rural areas where the population overexploits the tree cover. The contribution of the electricity and water sectors is still negligible. The oil sector has lost its importance since the secession of South Sudan, due to conflict and instability. However, artisanal and commercial gold mining has gained importance, as a substitute for lost income from oil revenues. HCENR, 2007. 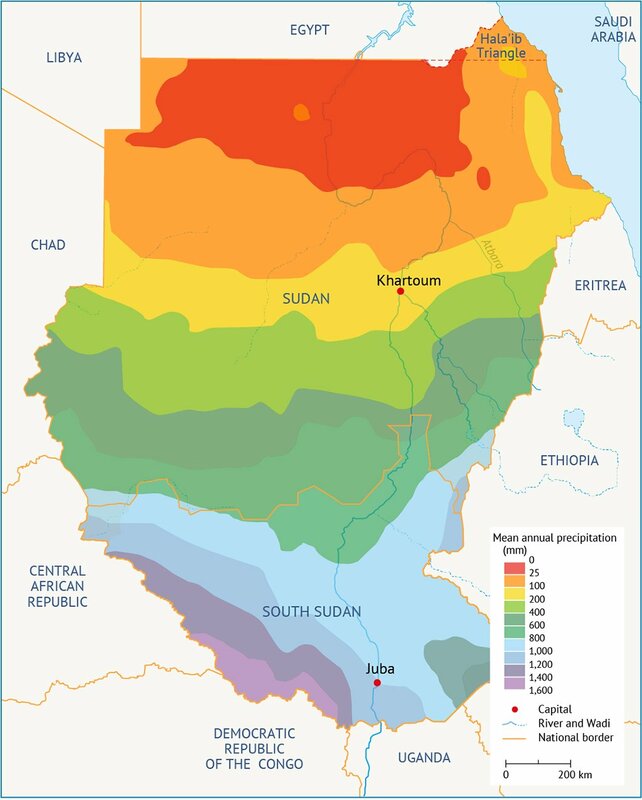 National Adaptation Programme of Action – Republic of the Sudan. Ministry of Environment and Physical Development Higher Council for Environment and Natural Resources. African Development Bank, 2013. South Sudan: An Infrastructure Action Plan – A Program for Sustained Strong Economic Growth. Available at http://tinyurl.com/lwlcmul, accessed [19/8/2017]. Available at http://countrymeters.info/en/Sudan, accessed [19/8/2017]. CBS, 2013. Central Bureau of Statistics Annual and UNFPA Fact Sheet on Population Dynamics of Sudan. WRI, 2008. World Research Institute Annual Report. Available at https://tradingeconomics.com/sudan/gdp-per-capita, accessed [19/8/2017].